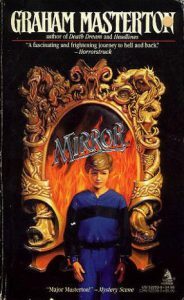 The main Character in Mirror is a man called Martin Williams. Martin is a screenwriter. He is also a man with an obsession. That obsession is Boofuls: a child star of 1930s musicals. Between writing scripts for hit TV shows, Martin writes a script for a musical biography of Boofuls’ short and tragic life. In 1980s Hollywood though, the name Boofuls holds no glamour or glitz. More than that, it is poison and no one wants to produce a film about a child star that, in an extreme act of overkill, was hacked into 211 pieces by his grandmother. It is the ending that has gone down in history. That is what is fixed in people’s minds and no one wants to be reminded of Boofuls with his curly, golden hair and darling voice. Martin also collects Boofuls memorabilia and, at around the same time as he is trying to find someone to produce his film, he goes to look at some furniture that originally came from the child star’s former home, and buys a mirror. It is a big mirror—six feet wide and five feet high—with tangles of grapevines carved into the frame and a grinning face cut into the very top of it. Martin thinks that the face might be that of Bacchus or Pan. It is a most unusual mirror. It was hung on the wall in the living room of Boofuls’ home and was in the room when he died. When Martin bought the mirror he also bought a whole load of problems and it takes him very little time to find that out. If you like your fiction packed full of supernatural forces and mysterious secrets, then you will probably enjoy reading Mirror. I read the paper back version and it was 345 pages long and as I journeyed through those pages I enjoyed the company of some very unique and interesting characters. I also met some extremely unusual ones. I liked most of them. There were a few I didn’t, but they were the proverbial bad guys, so that was okay. Unusual, but never predictable: if you are a horror fan, this is one mirror that it is worth looking into.